The formation and evolution of the Solar System is the name for the many ideas describing how the Solar System began and how it will carry on changing. The accepted idea is that 4.6 billion years ago, there was a very big cloud of gas in our area of space, known as a nebula. The nebula eventually became so big that gravity pulled all the gas to the center. Eventually because of all the gas it became so hot there that some hydrogen atoms fused together to make helium. This process by which the solar systems are created is called the nebular theory. The spin of the planets around the Sun, and each around its own axis was first caused by the original gas cloud having different density in different places. The spin increased as an effect of the contraction under gravity. So did the flatness of the solar system's shape. Gravity caused the atoms in the Sun to become very close to each other. All this energy eventually made our star: the Sun. The leftover gas mostly went to the gas giants—also known as Jovian planets. The rock and dust went off to make the terrestrial planets, their moons, asteroids and all other objects in the Solar System. Because of the sun's huge mass (99.86% of the whole mass of the solar system), it had very strong gravity that caused all of the surrounding celestial objects to stay in orbit around the sun. The huge density of its core causes a fusion reaction which turns hydrogen into helium with the radiation of heat, light and other forms of electromagnetic radiation. The solar system was now formed. Swedenborg first had the idea, and Kant worked it up into a proper theory. In 1755 Kant published his Universal natural history and theory of the heavens (in German, of course). 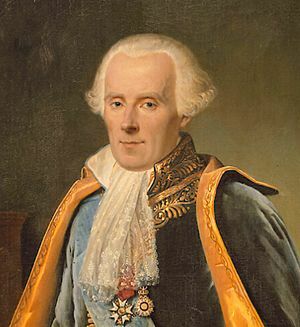 He argued that gaseous clouds, nebulae, slowly rotate, gradually collapse and flatten due to gravity. They eventually form stars and planets. Meanwhile, a similar model was developed independently and proposed in 1796 by Laplace. in his Exposition du systeme du monde. He thought that the Sun originally had an extended hot atmosphere throughout the volume of the Solar System. His theory had a contracting and cooling protosolar nebula. As this cooled and contracted, it flattened and spun more rapidly, throwing off (or shedding) a series of gaseous rings of material; and according to him, the planets condensed from this material. His model was similar to Kant's, except more detailed and on a smaller scale. Unfortunately, there was a problem with Laplace's version. The main problem was the angular momentum distribution between the Sun and planets. The planets have 99% of the angular momentum, and this fact could not be explained by the nebular model. It was quite a long time before this was understood. 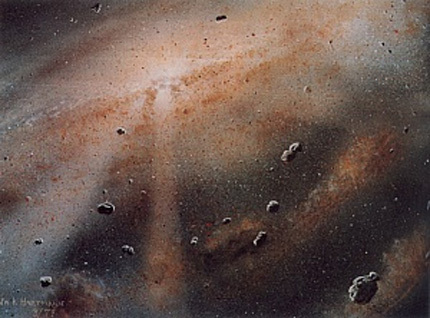 The birth of the modern widely accepted theory of planetary formation – the solar nebular disk model (SNDM) – is due to the Soviet astronomer Victor Safronov. His book Evolution of the protoplanetary cloud and formation of the Earth and the planets, translated to English in 1972, had a big effect. In this book almost all major problems of the planetary formation process were formulated and some of them solved. Safronov's ideas were further developed. There are still quite a few aspects of the Solar System which need to be explained. Although it originally applied only to our own Solar System, the SNDM is now thought to be at work throughout the universe. As of 1 October 2015, 1968 extrasolar planets have been discovered in our galaxy. Formation and evolution of the Solar System Facts for Kids. Kiddle Encyclopedia.